Gwendolyn Playing On Her iPod Touch; So Many Possibilities! I dont dream of her walking. I dont wish that she could climb a tree. and I know my little fighter would rise to the challenge with a smile. No, my wildest dreams are simple. Joe Barnick, thanks for the inspiration! Bill and I had a first -- and this is a big one -- we got a babysitter and went on a date without Gwendolyn! Over the last month we've been prepping Gwendolyn and getting her comfortable with her hot pink demo power chair at one of her therapy sessions every week. She's taken baby steps, as usual, warming up to the idea at first and slowly making her own decision when she's ready to take the next step. VIDEO: Gwendolyn Riding The "Magic Carpet"
On Monday, we had very exciting "first" -- and much sooner than we anticipated. 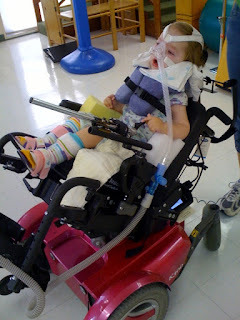 Gwendolyn got to see and try a Permobil K300 power chair. And it was hot pink! Check out Gwendolyn's rocket ship adventures with Mommy! She loves it.